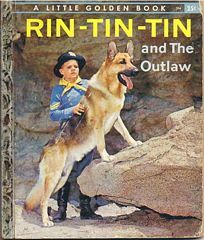 A Little Golden Book, Rin-Tin-Tin and The Outlaw. By Cahrles Spain Verral. Pictures by Mel Crawford. Publisher Simon and Schuster, New York. Copyright 1957, Screen Gems, autorized edition. Letter "A", first printing designation on last page. Condition fair+. Aging to pages. Wear to cover on corners and spine foil. Still holding strong but obviously a book that was read a good many times.